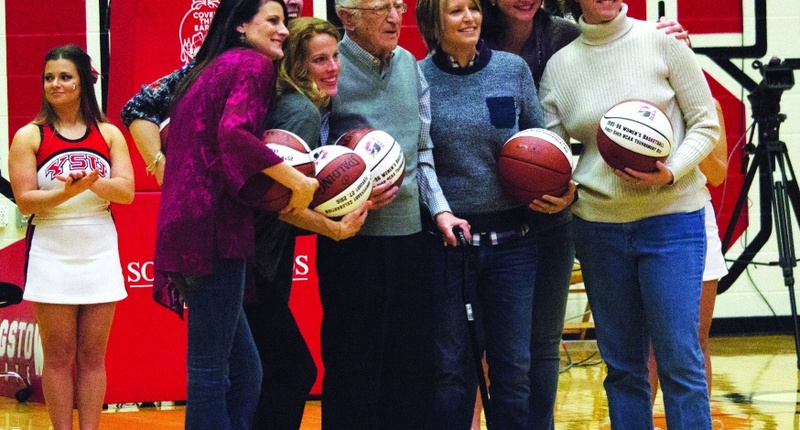 Twenty years ago, the Youngstown State University women’s basketball team took a step that had not been taken before in school history by reaching the pinnacle of college basketball, the NCAA tournament. The 1995-96 Penguins got off to a slow start that season, 3-11, and were only 7-7 through 14 games. But the Penguins caught fire winning 13 of their next 14 games and finished with a 20-9 record. Then, senior Shelly Allen said it was the work ethic that allowed them to play so well together. The team ran through the Mid-Continent Conference Tournament, winning all three games by double digits and earning birth in the NCAA tournament, the first in the history of YSU. Perhaps the most memorable moment of the entire season came from the Mid-Continent championship game against the University of Buffalo. Junior Shannon Beach dyed her hair green before the game to help motivate her team into March. 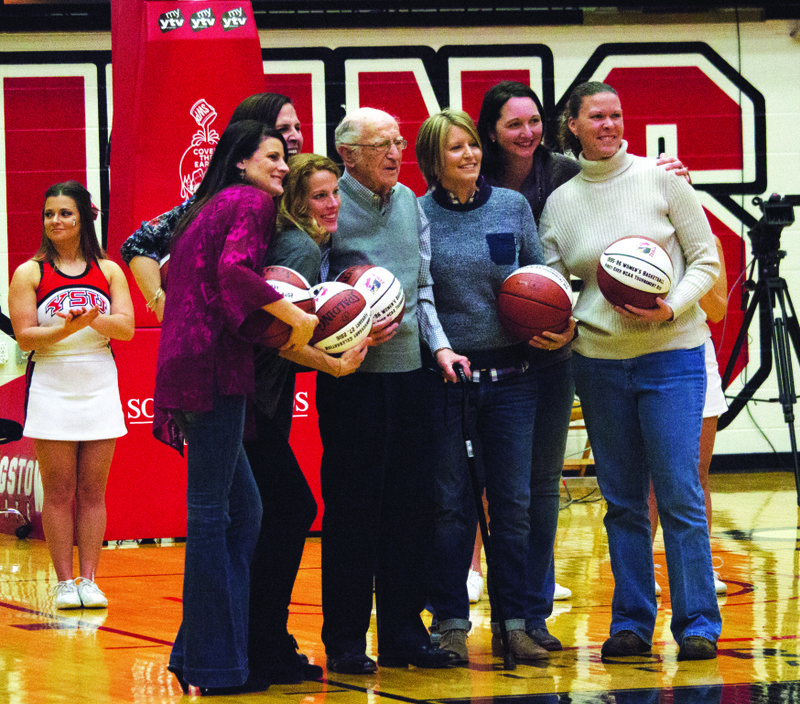 The 1995-96 Youngstown State University women’s basketball team receives special basketballs from YSU President Jim Tressel during the YSU men’s game versus Northern Kentucky. “There wasn’t enough time to go and change to wash it out, so she had to play with it. It kept us all calm for the championship game,” Allen said. Beach said she was just happy the Penguins were able to pull off the victory, or else the reaction to her hair may have been different. The Penguins made the NCAA tournament as the 15th seed and drew a tough matchup against the second seeded Penn State University in the first round. The Penguins played a tough game only trailing by one, 50-49. With only 15 minutes left to play, they were ultimately out matched by the Nittany Lions, losing 94-71. The Penguins would go on to make the tournament two more times over the next four years under head coach Ed DiGregorio, who was named to the YSU Athletics Hall of Fame in 2003. 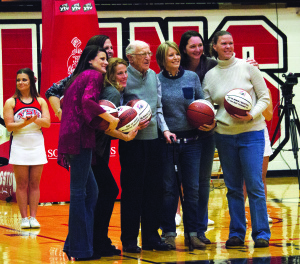 Beach said it was great to come back to YSU and finally be reunited with her team after 20 years.